In other words, as every functioning society understood until two generations ago, immigration has to benefit the people who are already here. Government owes a duty to its own citizens before those of the rest of the planet — no matter how cuddly and loveable they might be. The fact that it is necessary to state the obvious and that no “viable” “mainstream” candidate from either party is willing to state it is testament to how deformed contemporary western politics is…. Deformed as seen through the Funhouse Mirror of Sur-Reality. I know I’ve stated it many times before, but: the Western World has gone absolutely and totally Mad — bonkers, nuts, cuckoo for Coca Puffs, screwy Louie, loopy, etc..
Was The West destined to reach this state? These are two questions that have been on my mind for half a decade, at the very least. I think I’m getting closer to an answer as I continue my research of Western Thinking. A main factor seems to be the loss of a belief in God that kicked into gear starting with both the French and Scottish Enlightenments, picking up speed in starting in the late 19th Century with the mainstreaming of Leftist Thinking, which had, until then, been assigned to the fringes. Indeed, very, very few of our politicians, the bureaucrats who carry-out their schemes, and the people who vote for them are really ‘real’. 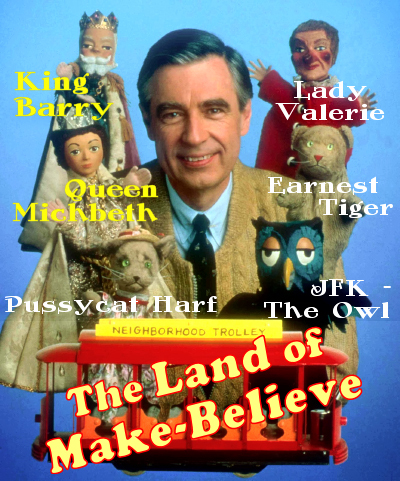 They’re living in a large-scale version of Mr. Rodgers’s Land Of Make-Believe. They’ve all emigrated to a pretend world. The thing is: Reality is a jealous creature and, when she bites back, she’s indiscriminate and rabid. And she’s always especially angry at those of us who know better, so we get chewed-up along with the Fools and Idiots [she’s also a sister of Nemesis]. I know I’ve stated it many times before, but: A Hard Rain’s Gonna Fall — and our bucket’s got a hole in it. This post is racist! I’m not sure why. But I feel it to be so and my feelings express my inner gender fluidity.